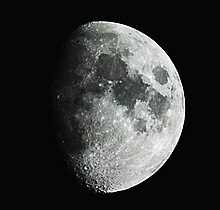 moon is part of the Basic English 850. The moon is the round white thing in the sky at night. It's like a small planet that goes around the Earth. I was able to see the road because there was a full moon that night. A moon is a thing like a small planet that goes around another planet. Galileo saw four moons of Jupiter: Callisto, Europa, Ganymede and Io. If you moon someone, you show them your bare buttocks. Someone in the car pulled down their pants and mooned us as they drove past. This page was last edited on 8 August 2017, at 02:15.